The events of December 7, 1941 united this country like nothing ever — or since. Patriotism united Americans during World War II to levels that would never be seen again. Feature films and recordings (78 rpm) from Hollywood celebrities brought this entire country together. Who will ever forget Kate Smith’s rendition of God Bless America, or Boogie-Woogie Bugle Boy from Company B by the Andrews Sisters? Even the Three Stooges got in some barbs at dear old Hitler. Transit Companies across America did their bit for the war effort also. Streetcars and buses appeared in patriotic paint schemes promoting War Bonds and other wartime issues. Los Angeles was no exception. Both the LARY and PE painted PCCs in special war-themed paint jobs. Pacific Electric selected car no. 5000 to be decorated in a special blue and silver paint job proclaiming “FLY for NAVY” It operated through the war in the very attractive paint scheme. 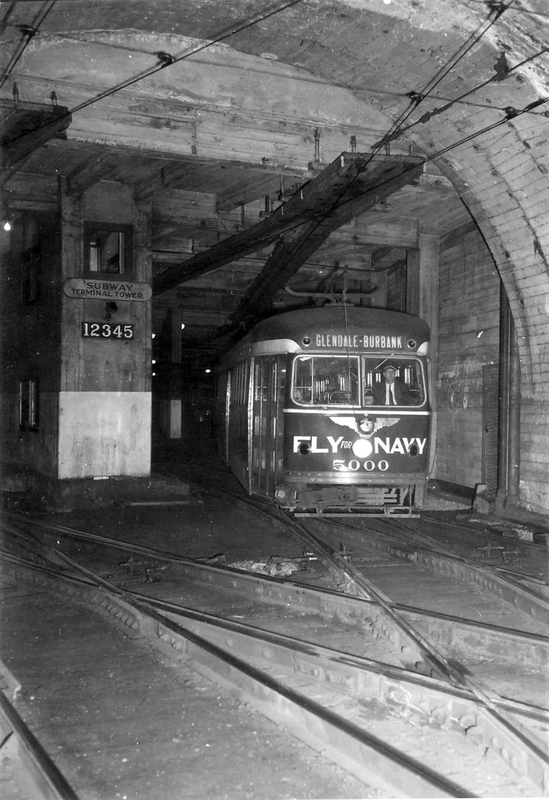 In this 1943 photo, the 5000 departs the Subway Terminal for a fast and comfortable trip to Burbank. Even though World War II was a terrible chapter in world history, the manner in which it brought America together will never be seen again.